Anheuser-Busch InBev SA and Heineken NV are fighting over who invented key parts of a new way to deliver draft beer that allows for smaller batches and eliminates the need for traditional steel kegs, which use compressed air and can degrade flavor over time. The companies started the first of two patent-infringement trials on Tuesday over the technology at the U.S. International Trade Commission in Washington. AB InBev says it developed the beer canisters, while Heineken -- whose case goes first -- contends it invented the dispenser equipment. Each is trying to keep the other out of the U.S. market to provide draft beer to smaller pubs and homes. Analysts say the $120 billion beer industry is getting more fragmented. 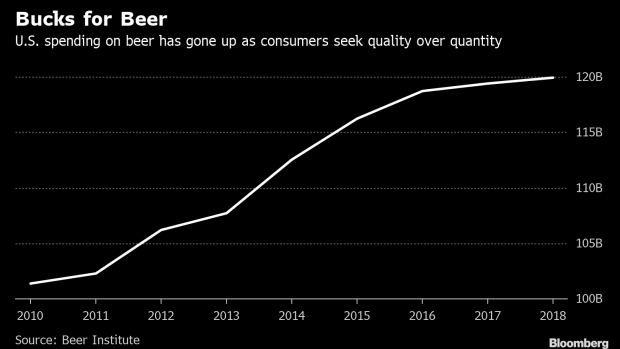 Americans are drinking less beer, but they are willing to pay for better quality. The big brewers are struggling to maintain their market share as even craft brews are losing ground to wine and other spirits. The overall volume of beer sales has been declining over the past decade, though dollar sales have increased, according to market researcher Euromonitor International. AB InBev -- maker of Budweiser and Stella Artois -- and Dutch brewer Heineken are looking for new markets in smaller bars or restaurants that don’t want to install big tap systems or by selling home machines that can serve draft beer. That’s led to the legal fights. The complaint filed by AB InBev was “not well-received by Heineken” which “pulled a single patent out of its quiver” in retaliation, Brinkman told the judge. He spent much of his opening arguments explaining the history of keg dispenser developments and rebutting AB InBev’s arguments that the patent is invalid. Moll presented his opening arguments outside of the public record because it involved AB InBev’s confidential business information. Beer is usually served in bottles, cans or the large steel kegs that aficionados claim provide the freshest flavor. On the downside, the kegs take up a lot of room and require gas to force the beer out, which can affect the taste over time. The new “kegs” are slimmer, sealed canisters in which the beer is kept in a bag and air is forced between the outer canister and inner bag, compressing the bag and pushing the beer up from the bottom. Since no air touches the beer, there’s no change in the flavor, and there’s no leftover beer in the keg. Heineken sells its namesake beer in a stand-alone keg called the Blade while AB InBev sells Stella Artois in its Nova system. Smaller versions of the canisters, holding four pints, are sold for home use. Heineken has a machine it calls Sub that’s sold under an agreement with closely held Hopsy LLC. AB InBev, the world’s largest beer maker, says it owns patents on those canisters, and is seeking to block imports of Heineken’s Sub and Blade systems. Brinkman told the judge that Heineken has suspended plans to import the Blade into the U.S. and contended the Subs shouldn’t be subject to an import ban, though that case is before a different trade judge. Heineken says it invented the machinery used in the AB InBev Nova system, particularly the dispensing line that’s designed to be more sanitary and require less maintenance than those in traditional keg systems. Restaurants and bars are the biggest source of beer sales, according to the Beer Institute, so the counter-top systems could open new draft markets to the brand companies. The market for the home draft system is still small, and the European counterpart “hasn’t really taken off,” Stirling said. Under the deal with Heineken, Hopsy offers a beer club from which consumers can get Sub mini-kegs from known brands like Heineken, Yuengling and Dos Equis or small breweries including the Blue Nose Brewery in Hodgkins, Illinois; Epidemic Ales in Concord, California; and Bronx Brewery in New York City. The U.S. patent battle is a new wave after a decade-old dispute in Europe. In 2007, Heineken and InBev settled a European patent battle over InBev’s PerfectDraft home systems. Meanwhile, Danish brewer Carlsberg A/S unsuccessfully sought to have Heineken’s European patent canceled in 2010. The battle will be decided at the ITC, a quasi-judicial agency set up to protect U.S. markets from unfair trade practices, including the infringement of patents. Heineken’s case against AB InBev is being heard first with a trial expected to last through April 23, with AB InBev’s complaint heard before a different judge starting May 6. The judges are scheduled to issue their findings in September, with final decisions from the commission in January. --With assistance from Ryan Beene, Thomas Buckley and Craig Giammona.